First of the latest batch of Year’s Bests anthologies to be reviewed this year is the twelfth in the Hartwell/Cramer series. There are slightly fewer stories in this year’s volume, due to the inclusion of fewer short-shorts from Nature magazine. than prevoius years. 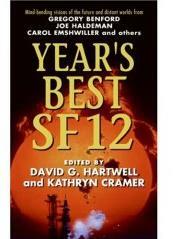 There’s a strong correlation between mine and the Hartwell/Cramer view on what constitutes the best science fiction, and the only problem with last year’s edition was that apart from the short-shorts, I had already read most of the stories in their original publication. This year, however, there were more stories unknown to me, and amongst these were some memorable ones. Nancy Kress Nano Comes to Clifford Falls. Originally in Asimovs, July 2006..
Clifford Falls being suburban America, to which several nano fabricators are delivered as this tech suddenly becomes ubiquitous. Young single mother Carol, her husband having run off with another woman, has less time for the free goodies that these offer than her neighbours. Her suspicions are proven correct when, with everything necessary being instantly on tap, there are suddenly few people willing to work – and the absence of teachers, nurses and police officers, are soon keenly felt. It’s not just the ‘burbs either, as things start to fall apart in the cities as well, and Carol comes face to face (or face to another anatomical body part) with the reality of the breakdown of law and order, and subsequently joins a small group in a secure commune, which begins to develop the societal rules and roles for the new order. The impact of this tech on a suburban family and community is particularly well-handled and effective. Terry Bisson Brother, Can You Spare a Dime? A neat little story in which a man suffering hard in the Great Depression comes across a traveller from the future. He follows the man to the future, which is that of the pulp sf magazines, which is truly Big Rock Candy Mountain but with spires. However, in trying to ensure that he plays out his part in making that future, he unwittingly does himself a big dis-service, and like the Little Match Girl, has a very short, cold, doorstep future awaiting him. Cory Doctorow. When Sysadmins Ruled the Earth. Deep in the basement of a computer network facility, fixing major network problems, an odd bunch of techies hovering at the edge of autistic spectrum disorders watch the world outside their air-conditioned, filtered building fall rapidly to its knees. Hi-tech and lo-tech terrors are unleashed, with the majority of the population falling to a fatal virus in a matter of hours. The ‘net may appear to be one route to salvation, but in the end any kind of future appears to be down to human strength and determination and colalboration. Heather Lindsley. Just Do It. Originally in Fantasy & Science Fiction, July 2006. Another new writer, with a look at a near future in which advertising has become much more targetted – literally, as the public are shot at with darts containing chemicals which create instant demand for product. A young woman gets in with an underground resistance faction, and intends to use her close relationship with the CEO of one of the advertising companies to strike at the heart of this menace, but finds that he is in fact faster on the draw. Originally in The Magazine of Fantasy & Science Fiction, June 2006. ‘All-Star Zeppelin Adventure Stories’ edited by David Moles and Jay Lake in 2004, included the well received ‘Biographical Notes to “A Discourse on the Nature of Causality, with Air-planes”’ by Benjamin Rosenbaum, which was a cracking story, in an alternate Earth where the narrator is a writer of ‘shadow history’. I mention this here partly as I’ve read this story but not reviewed it, and also because Dozois’ story is along similar lines, an alternate Earth in which, as recognised in the story, the outcome of the American Civil War is a different one, and the narrator is a journalist who has a sideline in writing scientifiction and counterfactual stories. Dozois’ alternate timeline is an altogether subtler variation on the ‘other side won’ argument, and there were doubtless some touches that I, not being American, didn’t pickup. The Dozois story is so well done in terms of characterisation and setting that it’s almost possible to overlook the quality of the writing, and the subtlety does rather throw into relief the clunkiness of a lot of other Alternate History (not that I read much of it). Apropos of nothing much, it struck me just now, that Paul Di Filippo’s ‘A Year in Linear City’ featured a writer of ‘cosmogonic fiction’, another example of the sf being written under another name. Edd Vick. Moon Does Run. Originally in Asimovs, April/May 2006. Kayle uses nano-tech to rent herself out as a vehicle for rich people to vicariously experience events without being there physically. At a remote wedding, Kayla finds herself fighting for her life with a handsome wedding guest, but begins to suspect that there is more than chance playing a part in events, as her employer hasn’t told her everything. She gets one over on her employer, destroying her memories to prevent them getting into her employer’s hands (or brain), but in doing so, damages here memories (and feelings) for her co-escapee. It’s a well-handled story, although from memory just lacking that little some extra which would have stopped it being in the top echelon of the year. Rudy Rucker. Chu and the Nants. Originally in Asimovs, June 2006..
Chu being a four-year old boy with an autistic spectrum disorder, and Nants being being bio-mimetic self-reproducing nanomachines, developed by the company which Chu’s father (himself a borderline autistic scientist). Fortunately, this isn’t (being Rucker it wouldn’t be) a standard scientist fiction story in which dad manages to help his son through his science. In fact, dad’s skills get to be used to send nants up onto Mars, where they create a quarter billion kilometer Dyson sphere. The mission is backed by the US government, and, surprise surprise, everyone on Earth gets to see the President’s face beaming down beningly on them. However, the nants have a mind of their own, and they use this to quite a dramatic effect – and humanity starts to embrace the Singularity as they are Strossed into virtual beings run in a reality controlled by the Nants. Chu’s dad is set against this, and the scientist fiction comes in as he, against the clock, tries to use his son as a physical Trojan, so that when his son is taken into the digital realm, that which is encoded in his brain, causes an almighty system crash. An excellent story – for my money, streets ahead of the Vinge’s pedestrian ‘The Cookie Monster’ a couple of years back, and good to see Rucker in Asimovs. Ian Creasey. Silence in Florence. Originally in Asimovs, September 2006. Historical fantasy with a difference. There are strange visitors from afar, but the high-born in the court do not spot just how different. It is the chambermaid, who has a more fundamental view, who is surprised at their non-use of the chamberpots, and who questions what they are. When one appears to have helped her disabled child, she has to find out whether these visitors or angels or devils – or merely v-e-r-y constipated medics? Or mayhap they are something not of this Earth? Kameron Hurley. The Women of Our Occupation. A short but intriguing story, in which the alien invaders are ostensibly more alien than they appear. Perhaps it is the case that we can have the truly alien within us, and it need not be BEMs which can cause a major change to the status quo? Claude Lalumiere. This is the Ice Age. Montreal has, as has the rest of Earth, been instantly overwhelmed by quantum ice, turning cities into bizarre, baroque ice sculptures (Lalumiere acknowledges the Ballardian influences). We see a young woman ekeing out an existence in the forbidding future, and look back on the instant when everything change. As the group they are with starts to descend into Lord of the Flies terrority, it is they who must flee. Short piece from Nature, in which even with enhanced intelligence, it is a dog eat dog world. Joe Haldeman. Expedition, with Recipes. Another shorter piece, and similar to the Lalumiere piece, to the extent that for my money you would put one of the stories in the anthology, but not both. In this one the post-catastrophe world sees youngsters as pretty much expendable, and against packs of ravaging dogs, and adults who will take their hard-earned food from them, life is brutal. Liz Williams. The Age of Ice. Originally in Asimovs, Apr/May 2006..
An intriguing fantasy story, that feels somewhat like an extract from a novel. The opening, in which a ‘flayed warrior’ appears before an undercover agent deep in enemy territory is an effective one, and we follow Hestia through capture, escape and ultimate success in her mission. However, whilst the background conflict and the politics behind it are described so well, or perhaps because of it, the story doesn’t quite grab as a discrete piece in its own right. Michael Flynn. Dawn, and Sunset, and the Colours of the Earth. Originally in Asimovs, Oct/Nov 2006..
A longer, multi-perspective story (it could perhaps have been separated from the previous multi-perspective story for the flow of the issue!). Marginally SF/speculative, in that the incident which several witness and many are affected by, is the sudden disappearance of a passenger ferry in Seattle bay. We hear second and third-hand about the disappearance, with some folk tales, some people for whom the loss of loved ones is heartbreaking, and some for whom the loss is not necessarily a bad thing. A transcript from an Internet message board shows one persons grief against the backdrop of inane conspiracy theorist chatter. There is a form of scientific rationale for this Bermuda Triangle type occurrence, but the description of a young boy desperately trying to follow the elder brother he worshipped is a heart-rending one, and five years on, this is a powerful 9/11 story. I didn’t re-read the story this time, but have to report there was a strong memory of the feeling of reading it last year, which has to be a good sign! Gregory Benford. Applied Mathematical Theology. A short-short, in which scientist have indentified a conundrum at the heart of our very creation – a message in the cosmic microwave background. However, unlike many stories of this ilk, solving the conundrum is far, far more difficult : indeed the answer may never be found. A very, very good story. A young girl and her friends are in a remote forest in mountains, and there is something slightly different about them. We gradually find out – an alien race, descended from dinosaurs, have crashlanded on Earth, and are trying to remain hidden whilst keeping their race alive as best they can. The dino-human chimeras are the solution. What Emshwiller brings to the story (and it’s quite subtle, which my preceding very quick background summary doesn’t do justice to) is a quite believable insight into alien creatures more in common with birds than humans. Its a deceptive story, with undertones and depth that slide by as the narrative progresses, and would justify a re-read. Originally in Forbidden Planets, ed Pete Crowther, DAW 2006..
..doesn’t attempt the dangerous planet principle of the collection, but neatly ties in with both the movie Forbidden Planet, and Shakespeare’s ‘The Tempest’ with a far-future brain-boggling billion brane-al setting. Travel between branes, in which each alternate universe has fractionally different physics, is possible, and Adam Fernando is a long way from home, investigating potential leaks from a sensitive research experiment. The story is relatively minimal, with Fernando investigating both the leak and the death of the main scientist. He gets a look at the very alien, very large scale tech which is available in this brane (as happens in the movie, with a nod to the aliens in the movie in the name given to these aliens), and comes to the conclusion that there have indeed been messages sent back across branes and across time, inspiring the likes of Shakespeare. Furthermore, he is convinced that the brane structure is in fact a circular one, and the alien ones who were spooked by what they saw billions of branes away were in fact spooked by their own images, from the rear, and he has to ensure that humanity doesn’t make the same mistake. Paul J. McAuley. Dead Men Walking. Originally in Asimovs, March 2006. This story is set on Ariel, Uranus’s fourth largest moon, and is the last testament of a genmod killer, who has been lying low on this out of the way moon for some time. A spate of vicious murders have raised his suspicions, and he realises that one of his kind has recently arrived, and will draw unwelcome attention which will undoubtedly blow his cover. He has to identify and confront his fellow killer, and it is this short, explosive and vicious encounter which has led him to his lonely, slow death.A good addition to an excellent series of stories. Originally in The Magazine of Fantasy & Science Fiction, December 2006. Gregory’s stories have pretty much fallen into two categories for me – those which impressed, and those which did little if anything for me. This story joins ‘Second Person, First Tense’ and ‘The Continuing Adventures of Rocket Boy’ in the former of these categories.It’s a strong story, starting with a ER visit from a woman who is accompanied by a man whom only she can see. We find out, gradually, just how and why her Christ-like companion has entered her life. Has she truly been the recipient of a revelation whilst on her own road to Damascus? Or is it catching, and is a variant-CJD causing temporal lobe epilepsy and sensations of euphoria and being in the presence of godhood. Gregory gets the reader into the head of the woman, who rues ever breaking bread with the women over the road, as the macabre details are revealed. Originally in Asimovs, August 2006. A more straightforward SF story than we normally get from Swanwick – in fact, almost Analog-esque. But only almost! A two-person team working on the very inhospitable surface of Venus have a very strained relationship – only the neural implants they have which constrain any acts or thoughts that would cause damage to Company property or each other prevent themselves from visiting physical violence upon each other. Or, more pertinently, prevent the man from using his hands on the woman, who has had him on the end of her sharp tongue for a long time. When an accident puts his implant out of commission, all bets are off, and she has to pit her cunning against his capacity, and desire, to do her serious harm. Under the unforgiving sun, we learn more about the couple, with the extent of the bitchiness of the woman throwing the actions of the man into a better light. Can she talk her way out of this one? Or, which makes the story work well, can she find some way out of the situation for them both? Unfortunately a maguffin appears, which saves the day, rather than her intrinsic cleverness, which slightly spoils the denoument. Ian R. MacLeod. Taking Good Care of Myself. There have been a number of stories in SF mags about dementia and ageing of late, and Macleod provides a neat sfnal twist : the frail elderly, rather than being a burden on relatives themselves ageing, are whisked back in time for their earlier selves to take of. A young man therefore has to make room for his mostly bed-ridden elderly self, and its a clever story, that in the hands of a less assured writer could have come out mawkish or much worse. Stephen Baxter. The Lowland Expedition. Originally in Analog, April 2006..
Another in a series of linked stories set in the intriguing ‘Old Earth’ in which time passes more quickly the higher you are. But for me the initial enthusiasm for the setting has waned a bit as Baxter ekes out more of his ‘sidebars’/’pendants’ as he is wont to call them. Short entertaining piece looking at a very uncertain schoolday, where chronarchy reigns. It reigns all day, and fitting in school and homelife is a chore. Originally in Asimovs, March 2006..
One of Reed’s neat stories which takes one or two ideas and explores them at just the right length, although I reckon his family must dread any conversation with him ending up, suitably sfnalled, in print. Here he takes as a starting point a young boy finding an empty chrysalis shell, and we are taken through a journey which starts out as a father-son relationship exploration, with clearly something not quite right. And it closes with a flourish, as the exact relationship between the two is explored, and the madness which has struck humanity which led to their finding each other is explained. Originally in Analog, June 2006..
No stone is left unturned by Rosenkranz in his hunt for humour as the US President scuttles to his deep place of safety as aliens arrive in orbit and start taking chunks out of humanity. Except that it’s not us that they’re after, as we’re deemed not a threat. The big threat to the galaxy are in fact our canine companions. In terms of Hartwell/Cramer’s 12th, there are only a couple of stories that I would quibble at, and in their place I’d have looked to put in one or more of the aforementioned stories (space permitting). But it’s a good collection of traditional science fiction, and as they state in their introduction, the collection makes no attempt to cover fantasy, horror, speculative, slipstream, or postmodern, and they see that genre boundaries can be a good thing. It will stand as a good record of what traditional North American science fiction was in 2006.